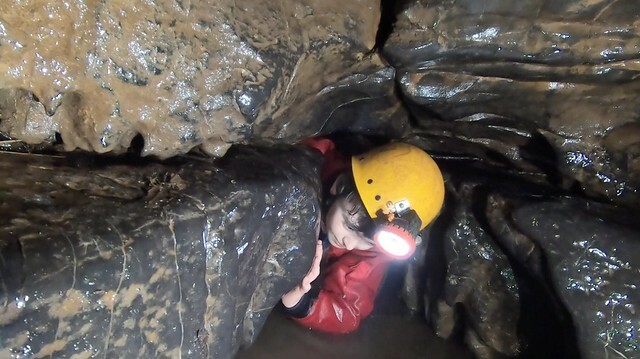 This video was made in collaboration with the Shropshire Scouts Caving Team. It was filmed on Sunday 3rd February in Llanymynech Ogof, on Saturday 9th February in Porth Yr Ogof & Bridge Cave and on Sunday 10th February 2019 in Ogof Ffynnon Ddu. To earn the caver activity badge each young person must take part in at least 4 trips to at least 2 different cave systems. Each visit must be as a member of a properly led group. A record should be made of the trips and the routes followed. A good knowledge should be developed of the caving and cave conservation codes, and the environmental issues around caving. The intention is to make a documentary film to promote the Caver Activity Badge but as this is likely to take some I've put together this short promotional video. 12 Likes paul, Greg Jones, Ouan, dudley bug, Jenny P and 7 more people like this. Really nice video good to see the next generation being introduced to the sport. Nice work! Idris/Dad told me about this last week. I'm looking forward to seeing the finished result! Thanks both. I was very honoured to be asked to produce a documentary for the Scouts. The children were all great and were very natural in front of the camera. The documentary will take a few weeks to edit so that's why I produced this short teaser. It does seem to have gone down well. 2 Likes Caver Keith and Ian Ball like this. The documentary is almost finished and so should be uploaded to YouTube within the next few days. 2 Likes PaulW and ttxela2 like this. The latest video from Caver Keith Productions.